WMLUG will display a 10×20 town/train layout, with buildings from western Michigan. Keep your eyes pealed for your favorite Super Heroes and Sci-Fi characters. Layout will include a Star Wars area as well. We will also bring a bunch of play brick for attendees to enjoy. There will be many vendors selling comic books, movies, various artists and more. Also at least one selling a Lego kits and minifigs. WMLUG will display a 5’x10′ sci-fi/space layout at the Kalamazoo Public Library. We will have a few members available to answer questions on Saturday from approx 1pm till close. 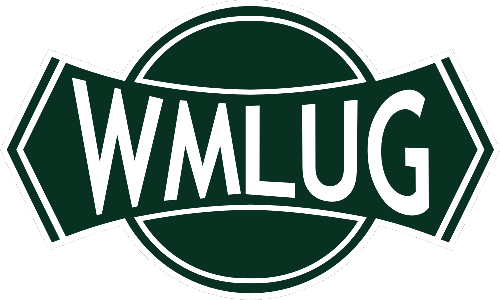 WMLUG members will meet in Grand Rapids at Larry Foster’s home on Saturday, May 11th, from 12:00pm till 3:00pm or so. Members and guests will share creations, talk about upcoming events and general Lego related conversation. The club will provide lunch (sandwiches) and beverages. Where: Grand Rapids, MI 49525 – Email club for exact address. When: Saturday, May 11th, 2019 – 12:00pm till approximately 3:00pm. WMLUG will display a town/train layout at the Portage District Library. Date/Time: Saturday April 13th, 2019 from 10:00am – 3:00pm. WMLUG will display at the Silver Beach Center a Lego city with multiple trains running and numerous wonderful creations. 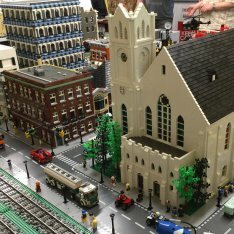 Buildings from St. Joseph, Benton Harbor, Kalamazoo and Grand Rapids have been recreated out of Lego and will be on the layout. We will also display a science fiction creations. Lastly WMLUG will provide play brick for kids to get some “hands on” fun as well. WMLUG will display a 10ft x 15ft layout at the Das Dutchman Essenhaus Train Show on Saturday February 16th, 2019. Many model railroad clubs will be displaying their layouts. Along with numerous vendors, with at least one selling Lego related items as well. Great food available at the Essenhaus restaurant. WMLUG will display a town/train layout at the New Year’s Festival in Kalamazoo on December 31st. Our display will be at First Baptist Church of Kalamazoo. The display will be open to the public from 5:30pm to 11:30pm. WMLUG will display a 12’x12′ town and train layout. It will feature several Grand Rapids buildings and two trolleys running through the streets. Please see the museum website for hours they are open.